P. H. Siegel, “Terahertz technology,” IEEE Trans. Microwave Theory Tech., vol. 50, pp. 910–928, Mar. 2002. A. Tessmann, I. Kallfass, A. Leuther, H. Massler, M. Kuri, M. Riessle, M. Zink, R. Sommer, A. Wahlen, H. Essen, V. Hurm, M. Schlechtweg, and O. Ambacher, “Metamorphic HEMT MMICs and modules for use in a high-bandwidth 210 GHz radar,” IEEE J. Solid-State Circuits, vol. 43, no. 10, pp. 2194–2205, Oct. 2008. R. J. Trew, “High frequency solid-state electronic devices,” IEEE Trans. Electron. Devices, vol. 52, pp. 638–649, May 2005. R. Quay, C. Moglestue, V. Palankovski, and S. Selberherr, “A temperature dependent model for the saturation velocity in semiconductor materials,” Mater. Sci. Semicond. Process., vol. 3, no. 1-2, pp. 149–155, 2000. Z. Griffith, Y. Dong, D. Scott, Y. Wei, N. Parthasarathy, M. Dahlström, C. Kadow, V. Paidi, M. J. W. Rodwell, M. Urteaga, R. Pierson, P. Rowell, B. Brar, S. Lee, N. X. Nguyen, and C. Nguyen, “Transistor and circuit design for 100–200-GHz ICs,” IEEE J. Solid-State Circuits, vol. 40, no. 10, pp. 2061–2069, Oct. 2005. M. J. W. Rodwell, M. Urteaga, T. Mathew, D. Scott, D. Mensa, Q. Lee, J. Guthrie, Y. Betser, S. C. Martin, R. P. Smith, S. Jaganathan, S. Krishnan, S. I. Long, R. Pullela, B. Agarwal, U. Battacharya, L. Samoska, and M. Dahlström, “Submicron scaling of HBTs,” IEEE Trans. Electron. Devices, vol. 48, no. 11, pp. 2606–2624, Nov. 2001. B. Y. Ma, J. Bergman, P. S. Chen, J. B. Hacker, G. Sullivan, B. Brar, “Ultrawideband ultra-low-dc-power high gain differentialinput low noise amplifier MMIC using InAs/AlSb HEMT,” in Proc. Compound Semiconductors ICs Symp., Portland, OR, Oct. 2007, pp. 213–216. D.-H. Kim and J. A. del Alamo, “30-nm InAs pseudomorphic HEMTs on an InP substrate with a current-gain cutoff frequency of 628 GHz,” IEEE Trans Electron. Device Lett., vol. 29, no. 8, pp. 830–833, Aug. 2008. M. Micovic, A. Kurdoghlian, H. P. Moyer, P. Hashimoto, M. Hu, M. Antcliffe, P. J. Willadsen, W. S. Wong, R. Bowen, I. Milosavljevic, Y. Yoon, A. Schmitz, W. Wetzel, C. McGuire, B. Hughes, and D. H. Chow, “GaN MMIC for E-band (71 GHz – 95 GHz) radio,” in Proc. Compound Semiconductors ICs Symp., Oct. 2008, pp. 10–13. M. Higashiwaki, T. Mimura, and T. Matsui, “Enhancementmode AlN/GaN HFETs using Cat-CVD SiN,” IEEE Trans. Electron. Devices, vol. 54, no. 6, pp. 1566–1570, June 2007. 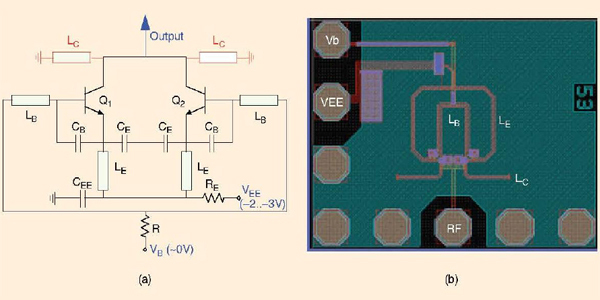 H. Amasuga, A. Inoue, S. Goto, T. Kunii, Y. Yamamoto, T. Oku, and T. Ishikawa, “A high power and high breakdown voltage millimeter- wave GaAs pHEMT,” in IEEE MTT-S Dig. Int. Microwave Symp., 2007, pp. 821–824. K.J. Herrick, K.W. Brown, F.A. Rose, C.S. 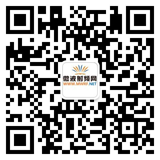 Whelan, J. Kotce, J.R. Laroche, Y. Zhang “W-band Metamorphic HEMT with 267 mW Output Power”, in Microwave Symp. Dig., 12–17 June 2005, pp. 843–846. D. L. Ingram, Y. C. Chen, J. Kraus, B. Brunner, B. Allen, H. C. Yen, and K. F. Lau, “A 427 mW, 20% compact W-band InP HEMT MMIC power amplifier,” in Proc. IEEE Radio Frequency ICs Symp., 1999, pp. 95–98. W. R. Deal,X.B. Mei, V. Radisic, M.D. Lange, W. Yoshida, P-H. Liu, J. Uyeda, M.E. Barsky, A. Fung, T. Gaier, and R. Lai, “Development of sub-millimeter-wave power amplifiers,” IEEE Trans. Microwave Theory Tech., vol. 55, no. 12, pp. 2719– 2726, Dec. 2007. B. Jalali, R. N. Nottenburg, Y. K. Chen, A. F. J. Levi, A. Y. Cho, and M. B. Panish, “Scaled AlInAs/InGaAs and InP/InGaAs heterostructure bipolar transistors,” IEEE Trans. Electron. Devices, vol.36, no. 11, p. 2602, Nov. 1989. Z. Griffith, E. Lind, M. J. W. Rodwell, Xiao-Ming Fang, D. Loubychev, Ying Wu, J. M. Fastenau, and A. W. K. Liu, “Sub-300 nm InGaAs/InP Type-I DHBTs with a 150 nm collector, 30 nm base demonstrating 755 GHz fmax and 416 GHz ft,” in Proc. Indium Phosphide and Related Materials, 2007 (IPRM ‘07), May 14–18, 2007, pp. 403–406. W. Snodgrass, Bing-Ruey Wu; K. Y. Cheng, and M. Feng, “Type-II GaAsSb/InP DHBTs with Record fT = 670 GHz and Simultaneous fT, fMAX . 400 GHz,” in Proc. IEEE Electronic Devices Meeting, Dec.10–12, 2007, pp. 663–666. J. Godin, V. Nodjiadjim, M. Riet, P. Berdaguer, O. Drisse, E. Derouin, A. Konczykowska, J. Moulu, J.-Y. Dupuy, F. Jorge, J.-L. Gentner, A. Scavennec, T. Johansen, and V. Krozer, “Submicron InP DHBT technology for high-speed, highswing mixed signal ICs,” in Proc. Compound Semiconductors IC Symp., Monterey, Oct. 12–15, 2008, pp. 109–112. B. A. Orner, M. Dahlstrom, A. Pothiawala, R. M. Rassel, Q. Liu, H. Ding, M. Khater, D. Ahlgren, A. Joseph, and J. Dunn, “A BiCMOS technology featuring a 300/330 GHz (fT/fmax) SiGe HBT for millimeter wave applications,” in Proc. BCTM, 2006, pp. 49–52. 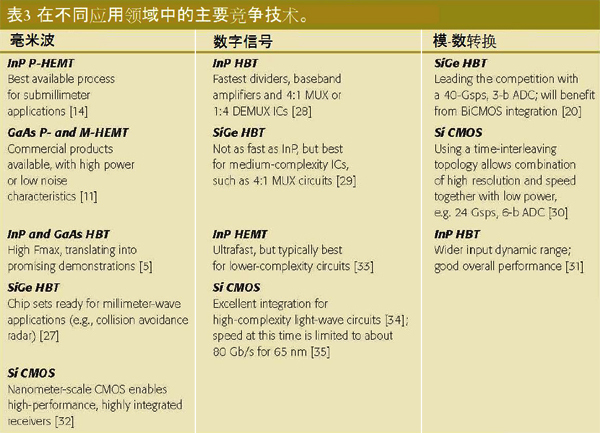 J. Lee, “High-speed analog-to-digital converters in SiGe technologies,” in Dig. IEEE Compound Semiconductors IC Symp., Portland, Oct. 14–17, 2007, pp. 93–96. E. Laskin, P. Chevallier, A. Chantre, B. Sautreuil, and S. Voinigescu, “165-GHz transceiver in SiGe technology,” IEEE J. Solid-State Circuits, vol. 43, no. 5, pp. 1087–1100, May 2008. S. Lee, B. Jagannathan, S. Narashimha, A. Chou, N. Zamdmer, J. Johnson, R. Williams, L. Wagner, J. Kim, J.-O. Plouchart, J. Pekarik, S. Springer, and G. Freeman, “Record RF performance of 45-nm SOI CMOS technology,” in Proc. IEDM, 2007, pp. 255–258. K. K. O, C. Cao, E.-Y. 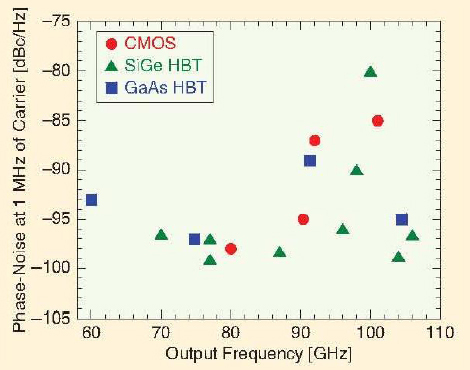 Seok, and S. Sankaran, “100–200 GHz CMOS signal sources and detectors,” in Dig. IEEE Compound Semiconductors IC Symp., Portland, Oct. 14–17, 2007, pp. 11–14. M. J. Rosker, V. Greanya, and T.-H. Chang, “The DARPA Compound Semiconductor Materials On Silicon (COSMOS) Program,” in Proc. Compound Semiconductors ICs Symp., Oct. 12–15, 2008, pp. 6–9. J. C. Li, K. R. Eliott, D. S. Matthews, D. A. Hitko, D. M. Zehnder, Y. Royter, P. R. Patterson, T. Hussain, and J. F. Jensen, “100GHz+ gain-bandwidth differential amplifiers in a wafer scale heterogeneously integrated technology using 250nm InP DHBTs and 130 nm CMOS,” in Proc. Compound Semiconductors IC Symp., Monterey, Oct. 12–15, 2008, pp. 227–230. G. Dewey, M. K. Hudait, K. Lee, R. Pillarisetty, W. Rachmady, M. Radosavljevic, T. Rakshit, and R. Chau, “Carrier transport in high-mobility III-V quantum-well transistors and performance impact for high-speed low-power logic applications,” IEEE Trans. Electron. Device Lett., vol. 29, no. 10, pp. 1094–1097, Oct. 2008. L. Wang, S. Glisic, J. Borngraeber, W. Winkler, and J.-C. Scheytt, “A singleended fully integrated SiGe 77/79 GHz receiver for automotive radar,” IEEE J. Solid-State Circuits, vol. 43, no. 9, pp. 1897–1908, Sept. 2008. J. Hallin, T. Kjellberg, and T. Swahn, “A 165-Gb/s 4:1 multiplexor in InP DHBT technology,” IEEE J. Solid-State Circuits, vol. 41, no. 10, pp. 2209–2214, Oct. 2006. M. Meghelli, “A 132-Gb/s 4:1 multiplexor in 0.13-μm SiGebipolar technology,” IEEE J. Solid-State Circuits, vol. 39, no. 12, pp. 2403–2407, Dec. 2004. P. Schvan, J. Bach, C. Fait, P. Flemke, R. Gibbins, Y. Greshishchev, N. Ben- Hamida, D. Pollex, J. Sitch, S.-C. Wang, and J. Wolczanski, “A 24GS/s 6b ADC in 90 nm CMOS,” in Dig. Tech. Papers, 2008 Solid-State Circuits Conf. (ISSCC), Feb. 3–7, 2008,pp. 544–638. B. Chan, B. Oyama, C. Monier, and A. Gutierrez-Aitkin, “An ultra-wideband 7- bit 5-Gsps ADC implemented in submicron InP HBT technology,” IEEE J. Solid- State Circuits, vol. 43, no. 10,pp. 2187–2193, Oct. 2008. E. Laskin, M. Khanpour, R. Aroca, K. W. Tang, P. Garcia, and S. P. Voinigescu, “A 95 GHz receiver with fundamental-frequency VCO and static frequency divider in 65nm digital CMOS,” in IEEE ISSCC Dig. Tech. Papers, Feb. 2008, p. 180. T. Suzuki, Y. Nakasha, T. Takahashi, K. Makiyama, T. Hirose, and M. Takikawa, “144-Gbit/s selector and 100-Gbit/s 4:1 multiplexer using InP HEMTs,” in Proc. 2004 IEEE MTT-S Int. Microwave Symp. Dig., June 6–11, 2004, vol. 1, pp. 117–120. K. Kanda, D. Yamazaki, T. Yamamoto, M. Horinaka, J. Ogawa, H. Tamura, and H. Onodera, “40Gb/s 4:1 MUX/1:4 DEMUX in 90 nm standard CMOS,” in IEEE ISSCC Dig. Tech. Papers, 2005, vol. 1, p. 152. S. Shahramian, A. C. Carusone, P. Schvan, and S. P. Voinigescu, “An 81 gb/s, 1.2v tiala-retimer in standard 65 nm cmos,” in Proc. IEEE Compound Semiconductor Integrated Circuits Symp., 2008, pp. 1–4. J. F. Jensen, M. Hafizi, W. E. Stanchina, R. A. Metzger, and D. B. Rensch, “39.5- GHz static frequency divider implemented in AlInAs/GaInAs HBT technology,” in GaAs IC Symp. Tech. Dig., 1992, pp. 101–104. M. Yoneyama, Y. Miyamoto, T. Otsuji, H. Toba, Y. Yamane, T. Ishibashi, and H. Miyazawa, “Fully electrical 40-Gb/s TDM system prototype based on InP HEMT digital IC technologies,” J. Lightwave Technol., vol. 18, pp. 34–43, Jan. 2000. 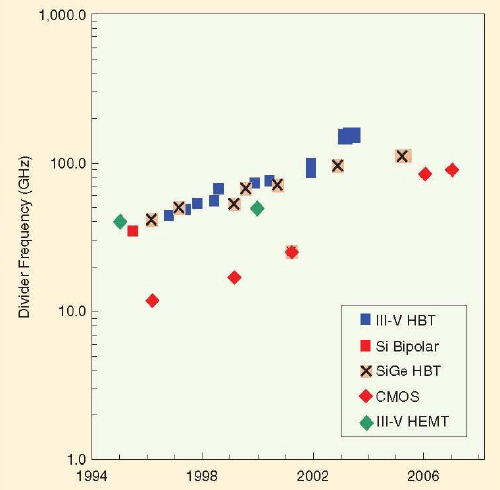 S. Trotta, H. Knapp, T. F. Meister, K. Aufinger, J. Böck, W. Simbürger, and A. L. Scholtz, “110-GHz static frequency divider in SiGe bipolar technology,” in CSIC 2005 Dig., 2005, pp. 291–294. D. A. Hitko, T. Hussain, D. S. Matthews, R. D. Rajavel, I. Milosavljevic, M. Sokolich, “State of the art low power (42 mW per flip-flop) 150 GHz+ CML static divider implemented in scaled 0.2 m emitter-width InP DHBTs,” in Indium Phosphide and Related Materials Conf. Proc., May 7–11, 2006, pp. 85–88. S. P. Voinigescu, R. Aroca, T. O. Dickson, S. T. Nicolson, T. Chalvatzis, P. Chevalier, P. Garcia, C. Garnier, and B . Sautreuil “Towards a sub-2.5 V, 100-Gb/s serial transceiver,” in Proc. IEEE CICC 2007, pp. 471–478. D. D. Kim, C. Cho, J. Kim, and J.-O. 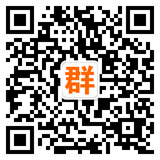 Plouchart, “Wideband mm- Wave CML static divider in 65nm SOI CMOS technology” in Proc. IEEE CICC 2008, pp. 627– 634. S.E. Rosenbaum, B.K. Kormanyos, L.M. Jelloian, M. Matloubian,A.S. Brown, L.E. Larson, L.D. Nguyen, M.A. Thompson, L.P.B. Katehi, and G.M. Rebeiz, “155- and 213-GHz AlInAs/GaInAs/InP HEMT MMIC oscillators,” IEEE Trans. MicroIEEE microwave magazine April 2009 86 wave Theory Tech., vol. 43, no. 4, pp. 927–932, Apr. 1995. V. Radisic, X.B. Mei, W.R. Deal, W. Yoshida, P.H. Liu, J.Uyeda, M. Barsky, L. Samoska, A. Fung, T. Gaier, and R. Lai, “Demonstration of sub-millimeter wave fundamental oscillators using 35-nm InP HEMT technology,” IEEE Microwave Wireless Comp. Lett., vol. 17, no. 3, pp. 223–225, Mar. 2007. 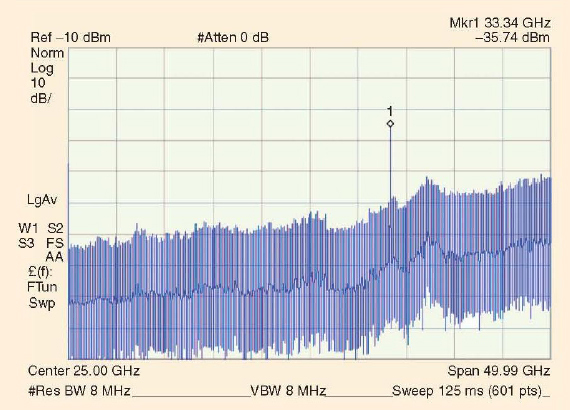 V. Radisic, D. Sawdai, D. Scott, W.R. Deal, L. Dang, D. Li, T. Chen, A. Fung, L. Samoska, T. Gaier, and R. Lai, “Demonstration of a 311-GHz fundamental oscillator using InP HBT technology, IEEE Trans. Microwave Theory Tech., vol. 55, no. 11, pp. 2329–2335, Nov. 2007. H. Li and H. Rein, “Millimeter-wave VCOs with wide tuning range and low phase noise, fully integrated in a SiGe bipolar production technology,” IEEE J. Solid-State Circuits, vol. 38, no. 2, pp. 184–191, Feb. 2003. F. Sinnesbichler, “Hybrid millimeter-wave push-push oscillators using silicongermanium HBTs,” IEEE Trans. Microwave Theory Tech., vol. 51, no. 2, pp. 422– 430, Feb. 2003. S. Kudszus, W.H. Haydl, A. Tessmann, W. Bronner, and M. Schlechtweg, “Pushpush oscillators for 94 and 140 GHz applications using standard pseudomorphic GaAs HEMTs,” in 2001 IEEE MTT-S Int. Microwave Symp. Dig., 2001, vol. 3, pp. 1571–1574. R. Wanner, R. Lachner, G. Olbrich, and P. Russer, “A SiGe monolithically integrated 278 GHz push-push oscillator,” in Dig. 2007 IEEE/MTT-S Int. Microwave Symp., June 3–8, 2007, pp. 333–336. C. Cao, E. Seok, and K. K. O, “192 GHz push-push VCO in 0.13 mm CMOS,” Electron. Lett., vol. 42, no. 4, pp. 208–210, Feb. 2006. E. Seok, K.K.O, “A 410GHz CMOS push-push oscillator with an on-chip patch antenna,” in Dig. Tech. 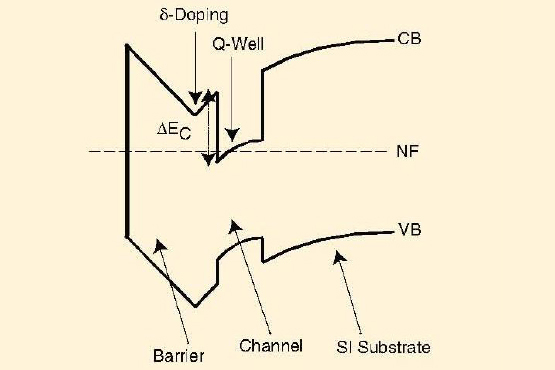 Papers of the 2008 Solid-State Circuits Conf. (ISSCC), Feb. 3–7, 2008, pp. 472–629. N. Weimann, V. Houtsma, Y. Yang, J. Frackoviak, A. Tate, and Y.K. Chen, “Fully dry-etched Inp double-hetero bipolar transistors with ft > 400 GHz,” in Proc. 2006 IEEE Device Research Conf., State College, PA.
 Y. Baeyens, N. Weimann, V. Houtsma, J. Weiner, Y. Yang, J. Frackoviak, P. Roux, A. Tate, and Y.K. 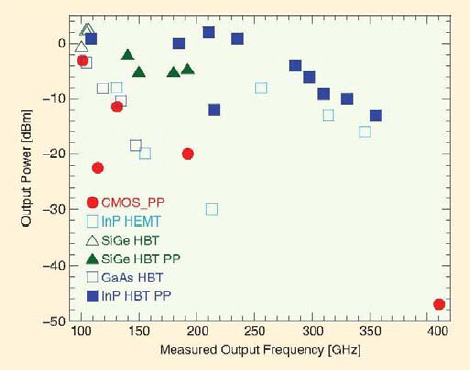 Chen, “Highly efficient harmonically tuned InP D-HBT push-push oscillators operating up to 287 GHz,” in Dig. 2007 IEEE/MTT-S Int. Microwave Symp., June 3–8, 2007, pp. 341–344. T. Swahn, Y. Baeyens, and M. Meghelli, “ICs for 100 Gb/s serial operation,” IEEE Microwave Mag., vol. 10, no. 2, pp. 58–67.